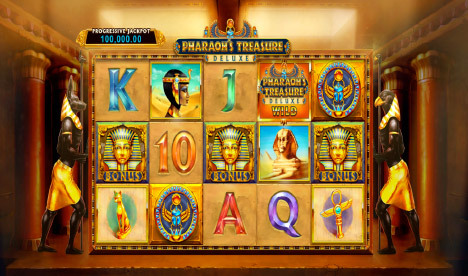 Fly Casino is pleased to present you Pharaoh’s Treasure Deluxe slot game. This progressive jackpot slot features 5-reels and 20 paylines is the next evolution of slot design here at Fly Casino with multiple innovative bonus features. Cash Prize Bonus feature –During this feature, pick gives you a cash prize as well as keys – the keys take you deeper into the tomb for more cash prizes or to the Sarcophagus Chamber for a chance to win the progressive jackpot. Vanishing Symbols Free Games feature – You will receive 15 free spins and vanishing symbols! An interesting new feature. After every 2 spins, a randomly chosen symbol is removed from the reels – this increases your chances of wins as there are less symbols on the reels. PLUS!, Look out for the Jackpot Key scatter symbol landing on reels 3, 4 and 5 during a free spin as this will give you access to the Sarcophagus Chamber for a chance to win the progressive jackpot. Progressive jackpot – You can get a chance to win the progressive jackpot during the free spins feature. By collecting a special symbol during free spins, you can be taken to another bonus level for your chance to win hundreds of thousands! Pharaoh’s Treasure Deluxe Hi-Roller Spins feature – By selecting the Hi Roller button below the reels. You then choose from 2 options each giving you 5 spins. Because you make really large bets means that you can possibly win super large amounts. If you are a higher level risk taker, then this feature is for you. If you like to play normally and enjoy the game, then avoid this. We are not a super fan of this feature, but many players do like it. Double $50’s gets $60 Bonuses! From 00:00GMT until 23:59 GMT, all members on their deposit of $/£/€50 or more will receive a $/£/€60.00 bonus. Claim it 2X! $200.00 BIG TUESDAY! From 00:00GMT until 23:59 GMT, all members on their deposit of $/£/€30 or more will receive a 100% bonus up to $200.00 bonus.